Francis E. Warren Air Force Base (AFB) (IATA: FEW, ICAO: KFEW, FAA Location identifier: FEW) is a United States Air Force base located approximately 3 miles (4.8 km) west of Cheyenne, Wyoming. It is one of three strategic missile bases in the United States. It is named in honor of Francis E. Warren. Warren AFB is the home of the 90th Missile Wing (90 MW), assigned to the Twentieth Air Force, Air Force Global Strike Command. The 90 MW operates the LGM-30G Minuteman III ICBM, with launch facilities in Southeast Wyoming, Western Nebraska, and Northern Colorado. It is also the home of Twentieth Air Force, which commands all United States Air Force ICBMs. Warren AFB is the oldest continuously active military installation within the Air Force, being established by the United States Army as Fort David Allen Russell in 1867. The facility came under United States Army Air Forces (USAAF) control on 1 June 1947, then under United States Air Force (USAF) control when the USAF became a separate entity on 18 September 1947. The 90th Missile Wing is commanded by Colonel Tracey Hayes. Twentieth Air Force is under the interim command of Major General Jack Weinstein. 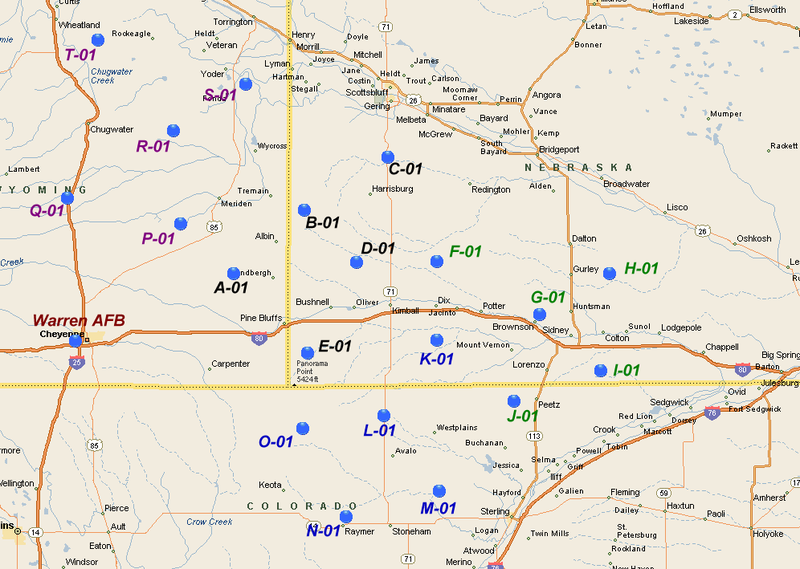 Warren AFB is delineated as a census-designated place by the U.S. Census Bureau. At the 2010 census it had a resident population of 3,072. The 90th Missile Wing, which was activated 1 July 1963, with the original designation of the 90th Strategic Missile Wing, became the nation's first operational Intercontinental Ballistic Missile base with the introduction of the SM-65D Atlas missile in 1958. Today, the 90th MW operates 150 LGM-30G Minuteman III ICBMs on full alert 24-hours a day, 365 days a year. Has dual responsibilities to Air Force Global Strike Command and United States Strategic Command. As the missile Numbered Air Force for AFGSC, 20th Air Force is responsible for maintaining and operating the Air Force's ICBM force. Designated as STRATCOM's Task Force 214, 20th Air Force provides ICBMs to the president. A UH-1 Iroquois (Huey) helicopter used by the 90th Security Forces Group. Unlike most Air Force Bases, Warren Air Force Base has no runway for fixed-wing aircraft. The only conventional airfield ever located at F. E. Warren AFB was a single dirt strip. This field, never used by modern day pilots, was made famous by World War I ace Captain Eddie Rickenbacker who crashed his plane on the field and survived. The airfield was used in 1919 by the "Western Flying Circus," then led by then-Major Carl "Tooey" Spaatz (later promoted to general and the first Air Force Chief of Staff). The base does maintain two active 100' x 100' heliports (north and south side) which is primarily utilized by Air Force UH-1N Twin Huey helicopters of the 37th Helicopter Squadron to ferry missile launch crews and maintenance personnel to various launch control centers and missile silos surrounding the base. Warren Air Force Base is named in honor of Wyoming's first United States Senator, Francis Emroy Warren (1844–1929). Senator Warren was awarded the Medal of Honor at age 19 during the American Civil War. The installation has an exceptionally long record of continuous military use. The history of the base dates back to the Railroad Act of 1862, when president Lincoln and Congress set plans for the transcontinental railroad, including a military installation on the eastern slope of the Rocky Mountains in the Wyoming Territory, to protect Union Pacific workers from hostile Indians. From these pioneer origins, the base has evolved from a noteworthy frontier infantry and cavalry post into the largest, most modern strategic missile facility in the United States. When President Lincoln and Congress set plans for the transcontinental railroad, they recognized the need for a military installation to protect Union Pacific workers from hostile Indians. On 4 July 1867, the railroad established its mountain region headquarters at Crow Creek Crossing, later known as Cheyenne. A few weeks later, the U.S. Cavalry moved from temporary headquarters in Cheyenne to a point 3 miles (5 km) west and established Fort D. A. Russell. Thus, 1867 was the beginning of a city and a fort, and both have grown together over the years. Detachments of the 30th Cavalry formed the first garrison, under the command of Colonel John D. Stevenson. For a brief time the troops lived in tents, but during the winter of 1867–68 they moved into wood-frame quarters. The dwellings were set in the shape of a diamond, instead of a rectangle, to protect against harsh winter winds that howled across the then treeless high plains. The diamond opened to the east and measured 800 by 1,040 feet (320 m). The entrance to the original fort was at a point next to the present day Chapel 1. The first troops stationed here lived the rough frontier life, which meant coping with the rigors of the weather in winter and with Indians in spring and summer. Fort Russell was made a permanent post in 1884 because of its strategic location. In 1885, the War Department ordered the post be rebuilt to serve eight infantry companies. The Army built 27 red brick buildings for $100,000 to replace the older wood frame structures, and planted thousands of trees. The last expansion of the base took place in the early 20th century when large barracks along Randall Avenue were constructed. Many of the early brick buildings were stables that housed nearly 20,000 horses and mules. From 1885 to 1930, more than 220 brick buildings were erected; most of them remain in use today. The base maintains the historic exterior of each building with appropriate interior modifications for today's living and working environment. In 1898, the Spanish-American War brought renewed importance to the post. Soon after President McKinley sent a message to Congress, the 8th Infantry left Fort D. A. Russell for Cuba. Later, the Wyoming National Guard mustered into service at the post and departed for duty in the Philippines. In the battle for Manila, the Guard was the first battalion to reach the walls of the city and to raise the flag. In 1901, troops from Fort Russell again went to the Philippines to help put down an insurrection and bring peace to the Pacific. They returned with a Queen Mary Tudor cannon forged in 1557 and the Bells of Balangiga. The seven-foot cannon, the only one of its kind in America, and the bells, which had been used by insurrectionists as a signal to launch an ambush on American troops, are on display near the base flagpole. What stands as quarters No. 2 today was, in 1885, the post commander's home. By tradition, the post commander always occupied the largest house on post. Hence, the commander moved into quarters No. 8 when it was built in 1903. Quarters No. 2 was then assigned to the family of Captain John "Black Jack" Pershing, who later led American forces in Europe during World War I. Pershing married U.S. Senator Francis E. Warren's daughter, but she preferred staying with her father when her husband was on campaign. Due to the influence of Warren, Pershing was promoted to general within six months of his marriage. Pershing was promoted to General of the Armies, a position shared by only one other man, General George Washington. In 1927, the last cavalry units left the installation, ending 60 years of cavalry history at Fort Russell. President President Hoover issued a proclamation in 1930 which renamed the post "Fort Francis E. Warren," to honor Wyoming's territorial and first state governor. Warren was a U.S. Senator for 37 years and died in office in November 1929 at the age of 85. He received the Medal of Honor when he was 19, for heroism during the Civil War. Other well-known figures stationed here include General Billy Mitchell (the "Father of the Air Force"), General Mark Clark (World War II (General in Europe), General Benjamin O. Davis, Sr. (first black general), Dr. Walter Reed and singer Sammy Davis, Jr.. Entertainers Neil Diamond and Chris LeDoux grew up at this installation. Former Wyoming Supreme Court Justice Richard V. Thomas was a JAG officer at the base from 1956–1959. At the end of World War II, city officials in Spokane, Washington, had tried to acquire joint use of facilities at Geiger Field. Air Training Command used Geiger as its Aviation Engineer Training Center and the Army Air Forces was opposed to sharing facilities with civilian authorities. Instead, Headquarters USAAF directed ATC to transfer its training mission from Geiger Field to Fort Francis E. Warren in Wyoming. ATC training stopped at Geiger Field on 15 May 1947, and Air Training Command assumed jurisdiction of Fort Francis E. Warren on 1 June. The 463d Air Force Base Unit was activated that date to manage the support facilities, and the 3450th Technical Training Wing was activated for conducting training. Training began at Warren on 7 July. In September 1947, Fort Warren, along with other Army Air Force facilities, was transferred to the newly established United States Air Force. In March 1949, HQ ATC was directed to re-program, as a part of an overall restructuring to a 48-group Air Force. The statement of trained personnel requirements gave priority to radio, radar, armament, and aircraft maintenance training programs. To meet these training requirements, it was necessary for ATC to find additional space for these courses. To do that, the Air Force announced on 17 January that all aviation engineering courses at Fort Warren, with the exception of powerman, would transfer to the Army's Engineer School at Fort Belvoir, Virginia. In addition, the fixed wire courses at Scott AFB went to Fort Warren, so that Scott had room to expand its radio mechanic school. On 7 October 1949, Fort Francis E. Warren became Francis E. Warren AFB. As a result of the Korean War, Air Training Command had to in-process thousands of volunteer reservists. Between late July and the end of October 1950, the command brought on active duty about 20,000 reservists. Most of this work was done at Warren AFB. In 1957, in response to budget reductions, Air Training Command formed a base utilization board to examine all its facilities, looking at existing and future training requirements. That board concluded that two bases could be released—Francis E. Warren and Scott AFB, Illinois. Warren AFB had a number of strikes against it, including poor weather conditions that limited training to seven months of the year, lack of a flying field, and many inadequate buildings. In 1958, Air Training Command finally received permission from Headquarters USAF to phase out its training programs at Francis E. Warren AFB. Effective 1 February 1958, the base transferred from Air Training Command to Strategic Air Command. Training, however continued until 24 March 1959, and on 1 May ATC discontinued its 3450th Technical Training Group. With the transfer of Warren AFB to SAC, the 389th Air Base Group was established on 1 February 1958 to take control of the former ATC facilities. In addition the provisional 4320th Strategic Missile Wing was established that date with responsibility for 24 Atlas missile sites under Strategic Air Command. Although not the first designated missile wing, Warren became the first fully operational ICBM base in the United States Air Force. Originally, the project design for the above-ground SM-65D Atlas ICBM launch and control facilities at "Site A" was to be completed by mid-May 1958 and construction finished in November 1959. However, design revisions delayed the project several months. Construction began at a location 23 miles (37 km) northwest of Cheyenne in late 1958 for the facilities of the recently activated 706th Strategic Missile Wing, which would control the ICBMs. On 15 September 1959, the first Atlas D missile to deploy away from Vandenberg AFB, California, went to the 564th Strategic Missile Squadron stationed at the Warren I complex. A month later, F.E. Warren became the recipient of the first air transported Atlas missile. With General Power (the Commander in Chief of SAC) present, the first Atlas D complex was turned over to the 564th SMS and declared operational on 9 August 1960. As work proceeded at the Warren I complex, the Army Corps of Engineers contracted for yet another complex. In February 1959, bids were opened for "Warren II," a complex that would have three sites with three Atlas-D launchers at each. The Warren II site was ready in the summer of 1960. The 565th Strategic Missile Squadron, activated on 1 December 1959, operated the nine launchers. The Warren III site, designed for nine SM-65E Atlas missiles would be scattered over a 60-square-mile (160 km2) area at single "coffin" launch sites. The term "coffin" was used because the missile laid on its side underground with the coffin roof at ground level. This configuration offered limited protection for the launcher. On 1 October 1960, the 549th Strategic Missile Squadron became the last Atlas-E SMS to be activated. The 549th SMS was redesignated 566th SMS on 1 July 1961. On that same date the parent 706th Strategic Missile Wing stood down. Command responsibilities at Warren AFB were assumed by the recently activated 389th Strategic Missile Wing. In May 1964, as the 565th and 565th SMS Atlas-D missiles were being phased out, the 389th Strategic Missile Wing received SAC's last operational readiness inspection for this system. In September, SAC inactivated the 564th SMS. During the following March, the 566th SMS Atlas-E's would also be deactivated, completing the phaseout of the Atlas Missile at Warren. The departure of the Atlas squadrons did not mark the end of F.E. Warren's role in the ICBM program. On 15 October 1962, Morrison-Knudsen and Associates won the contract to construct 200 LGM-30A Minuteman I missile silos over an 8,300-square-mile (21,000 km2) area of Wyoming, Nebraska, and Colorado, located north and east of the base. On 1 July 1963, the Air Force activated the 90th Strategic Missile Wing. Over the next year, four component strategic missile squadrons activated with the 400th SMS became the last Minuteman I "B" unit to stand up on 1 July 1964. In November 1972, SAC initiated the Minuteman Integrated Improvement Program. The program entailed silo hardening and upgrading command data buffers, which allowed for quicker missile retargeting. In addition to receiving upgraded silos and launcher control facilities, Warren also received new missiles. With conversion to the LGM-30G Minuteman III model, Warren's last Minuteman IB model went off alert status in September 1974. On 22 November 1982, in a decision statement for Congress, President Ronald Reagan stated his plan to deploy the MX missile dubbed "Peacekeeper" (later designated LGM-118 Peacekeeper) to superhardened silos located at F.E. Warren. Capable of carrying up to 10 independently targeted nuclear warheads, the Peacekeeper was designed to strengthen the ground-based strategic policy of the United States. The initial plan was to deploy 100 Peacekeepers in silos of the 400th and 319th Strategic Missile Squadrons. In July 1984, construction began for Peacekeeper support facilities at Warren. From 1986 through 1988, 50 Peacekeepers would be backfitted into silos formally occupied by Minuteman IIIs of the 400th Strategic Missile Squadron. In 2002, President George W. Bush set a plan in motion to reduce the country's missile forces from 6,000 to between 1,700 and 2,200. Russian president Vladimir Putin agreed to follow a similar plan. As part of this reduction, the Peacekeeper missiles would be taken off alert and inactivated. Inactivation of Peacekeepers began in 2002, and the last missile was inactivated on 16 September 2005. Squadron inactivation followed on 19 September 2005. The end of the Cold War and combat during Operation Desert Storm in 1991 resulted in significant changes to the organizational structure of the United States Air Force. On 1 September 1991, Twentieth Air Force was reactivated by Strategic Air Command and became operationally responsible for all land-based Intercontinental Ballistic Missiles. On 1 June 1992, Warren transitioned from the inactivating SAC to newly established Air Combat Command, and finally, on 1 July 1993 to the Air Force Space Command. This realignment was designed to take advantage of the similarities between missile launch and space launch operations. The 90th Strategic Missile Wing was also renamed the 90th Missile Wing. The wing became the 90th Space Wing on 1 October 1997. With the ratification of the Strategic Arms Reduction Treaty I, the United States had until December 2001 to reduce its nuclear arsenal. As a result, the 90th Missile Wing reduced the fleet from three reentry vehicles permissible to a single reentry vehicle configuration. On 6 August 2001, all 150 Minuteman IIIs had been converted to a single reentry vehicle, beating the December deadline. Warren missile fields currently maintain 150 Minuteman III missiles, split evenly between the 319th, 320th, and 321st Missile Squadrons. On 1 July 2008, the 90th Space Wing was redesignated the 90th Missile Wing, per the order of outgoing Air Force Chief of Staff General T. Michael Moseley as a way of refocusing the unit on the nuclear surety mission after the 2007 United States Air Force nuclear weapons incident. The final transition for Twentieth Air Force occurred Dec.1, 2009, placing all U.S. ICBM forces under Air Force Global Strike Command, headquartered at Barksdale AFB, Louisiana. This realignment ultimately placed ICBMs and bombers with similar missions under a single command. The 90th Missile Wing was selected as the first missile base to upgrade Minuteman III launch control centers with the rapid execution and combat targeting modification. Existing LCC's had not been upgraded significantly since being brought on line in the early 1960s. REACT replaced the command and control consoles with a single, integrated, computer-processing console. Major improvements in automation allow combat crews to more rapidly process message traffic and carry out execution orders if needed. Due to the remoteness of the locations where they were constructed in the late 1950s and early 1960s, the Warren Atlas sites have not been redeveloped since their closure in 1965. The 564th SMS A/B Warren I site is completely abandoned. The public road "Atlas Road" ends at a fence with an "No Tresspassing" sign about 2 or 3 miles (4.8 km) from the actual site, and the road past the gate appears to be well cracked and vegetation is growing out of the unmaintained surface. The site itself, which is in private ownership, when viewed from aerial images looks as if it has been abandoned for decades, The above ground launchers and support structures left as they were when inactivated nearly 50 years ago. Roofs of some structures still exist, others do not. The access roads are very deteriorated as well, with large areas of vegetation growing though the cracks in the surface. With the deployment of the LGM-118A, 50 former Minuteman III silos were converted. 400th Strategic Missile Squadron Flights P through T were reassigned to to the Peacekeeper for operational duty. As of the census of 2000, there were 4,440 people, 639 households, and 631 families residing on the base. The population density was 888.3 people per square mile (342.9/km²). There were 735 housing units at an average density of 147.0/sq mi (56.8/km²). The racial makeup of the base was 79.6% White, 9.4% African American, 0.5% Native American, 2.2% Asian, 0.3% Pacific Islander, 4.4% from other races, and 3.6% from two or more races. Hispanic or Latino of any race were 8.8% of the population. There were 639 households out of which 82.0% had children under the age of 18 living with them, 92.2% were married couples living together, 4.1% had a female householder with no husband present, and 1.1% were non-families. 1.1% of all households were made up of individuals. The average household size was 3.59 and the average family size was 3.58. On the base the population was spread out with 23.0% under the age of 18, 26.7% from 18 to 24, 48.4% from 25 to 44, and 1.8% from 45 to 64. The median age was 25 years. For every 100 females there were 201.2 males. For every 100 females age 18 and over, there were 259.4 males. ↑ "Profile of General Population and Housing Characteristics: 2010 Demographic Profile Data (DP-1): Warren AFB CDP, Wyoming". U.S. Census Bureau, American Factfinder. http://factfinder2.census.gov. Retrieved 3 April 2012. ↑ "Press Release: Death of Richard V. Thomas". courts.state.wy.us. http://www.courts.state.wy.us/JusticeThomas.pdf. Retrieved 13 September 2010. Wikimedia Commons has media related to F. E. Warren Air Force Base.